All sport and physical activities need a place to play whether it is a local park, sports club, cycle path, school or leisure centre. Through local knowledge and connections, the Active Partnership is able to identify gaps and opportunities and support partners to maintain and enhance existing provision, provide new facilities where they are needed and secure facility time for activity providers. Following the successful delivery of the Olympic Mountain Bike venue for the London 2012 Olympic and Paralympic Games. Essex County Council, through the Active Essex Team, secured £6.8 million to design, build and deliver the Hadleigh Park legacy project. This has been achieved through effective partnership working with Essex County Council, Castle Point Borough Council, Salvation Army, Ringway Jacobs, Mitie, Natural England, Highways Agency, British Cycling and Sport England. - New trails - Unique 5km Olympic mountain bike course and 4km off-road cycling trails; 8km multi-use trail for walkers, cyclists and horse riders; mountain bike skills park; new walking trails and viewpoints, 5.3km horse riding loop; a cross country running and orienteering facilities. - New supporting facilities - changing rooms, toilets, café, bike hire/shop, and multi-use space for event, education, community use; improved car park; and a new programme of sport and recreation events. Active Essex has also formed a new cycling club and are developing several running clubs, one of which now boast over 400 members. Since the Olympics, Hadleigh has hosted six National Cycling Competitions and a number of high profile running races. 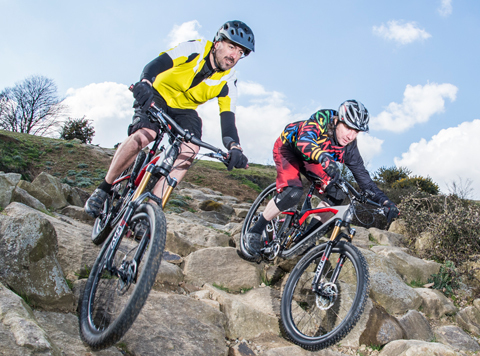 Active Essex have successfully integrated the legacy of the London 2012 Olympic Mountain Bike track into a wider legacy of active outdoor recreation, opening sport to a wide range of new users.